Antique Billhead-Bartram, Robinson & Co.-Dallas, Texas-1885 Price:$9.99+$5.00 S&H Take a trip in time back to the wild west. Texas was on the edge of the frontier where the six gun still ruled. Cattle drives, gunfights, and drinking and gambling in the saloons was the order of the day The streets were filled with buckboards and horses rather than automobiles. This is a 126 year old billhead dated September 2, 1885 from Bartram, Robinson & Co.of Dallas, Texas. 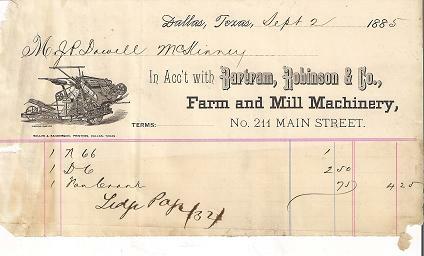 It was for a sale made to J.P. Dowell of McKinney, Texas. Mr. Dowell ran a hardware store in downtown McKinney. It measures 8 1/2 inches by 4 3/4 inches and is in excellent condition.